A kid that has played in back to back state title games, Nick Underwood (6-1 220 Sr. LB) of Lake Oswego, will be a three year all league starter and recently just landed his 3rd D1 offer from UNLV. 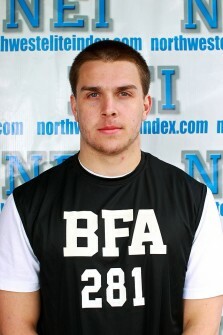 Underwood was a standout at our elite events and on the Barton Camp and Combine Tour this past off season. He is in my opinion one of the most talented kids anywhere in the west, not necessarily looking the part at first glance but absolutely dominating football games with his balance and precision. Nick was (27-1) with a state title coming into this year as a Laker. They are a young team and currently playing much better, with last weeks 35-14 win over Canby. They will play #6 Clackamas (6-0) tonight and we will continue to bring you updates on the all state backer for years to come.